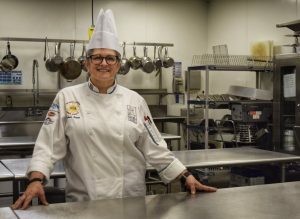 (WACO) – Executive Pastry Chef Michele Brown wants to bring the world to Culinary Arts majors at Texas State Technical College. And she has the credentials to back up her vision. Brown is a two-time member on regional Texas teams competing in the IKA/Culinary Olympics held every four years in Germany. She also provided support for Epicurean World Master Chefs Patrick Mitchell and Morris Salerno on the gold medal winning regional Texas team at the 2014 Expogast Villeroy and Boch Culinary World Cup in Luxembourg. One of Brown’s goals as the new lead instructor in TSTC’s Culinary Arts program is to encourage students to do competitions not only to practice their skills, but to see what else is going on in the world. Brown wants to see program faculty visit area schools to recruit students and increase interest in SkillsUSA. She also wants to get the program certified through the American Culinary Federation. Brown said having an ACF-certified program means TSTC can host certification testing. Also, Culinary Arts graduates can earn their organization certification, making them marketable to employers. Chef Gayle Van Sant, a TSTC Culinary Arts instructor, has known Brown for years through their involvement in the Texas Chefs Association. Brown has had her eye on TSTC for a while. She met TSTC’s Chef Mark Schneider through the Texas Chefs Association and has kept up with the program’s growth. “The caliber of students has really impressed me,” Brown said. Brown said she enjoys teaching because she can take pride in students making their own discoveries. “I like that moment the students get when they learn flour, eggs, sugar and yeast are not scary,” she said. Brown grew up in northern Illinois. She said one of her first culinary experiences as a child was making chocolate chip cookies for her father. Her gift for the achievement was a mixer. Brown was involved in theater and worked in baking throughout high school. She has an associate degree in pastry arts and an associate degree in Food Service Management from Johnson & Wales College (now Johnson & Wales University) in Providence, Rhode Island. After college she worked at restaurants in New York City. Brown earned the Certified Baker designation from the American Institute of Baking in 2010 and the Certified Executive Pastry Chef credential from the American Culinary Federation in 2017. This entry was posted in Waco on September 27, 2018 by Daniel Perry.